Reports credited spotters, for whom the “tracking of planes has become a kind of global sport,” with providing images and information that tracked the plane’s prior movements. Photographs culled from JetPhotos.net and other online databases revealed that the plane had been sighted in Zurich, around the time of the World Economic Forum; previously it was spotted heading to Ghana from the UK. Federal Aviation Authority (FAA) records showed that the plane was registered under a Bank of Utah trust, which had shielded the identity of the true owners. After the New York Times coverage revealed that a Ghanaian mining company headed by the brother of that country’s president had used the aircraft to travel to Tehran, an Iranian Foreign Ministry spokeswoman clarified that there were no Americans on the plane. The Ghanaian mining company that leased the plane from the Bank of Utah trust insisted that they had not violated any FAA regulations, but according to US officials, concerns remained about the legality and transparency of an American-registered plane being used for any commercial or diplomatic purposes in Iran. These points would have never come to light if not for the pictures snapped in London, Zurich, and Tehran. With all the questions left unanswered in the Mehrabad affair, one thing was certain: If no one had spotted it, the plane wouldn’t have existed. 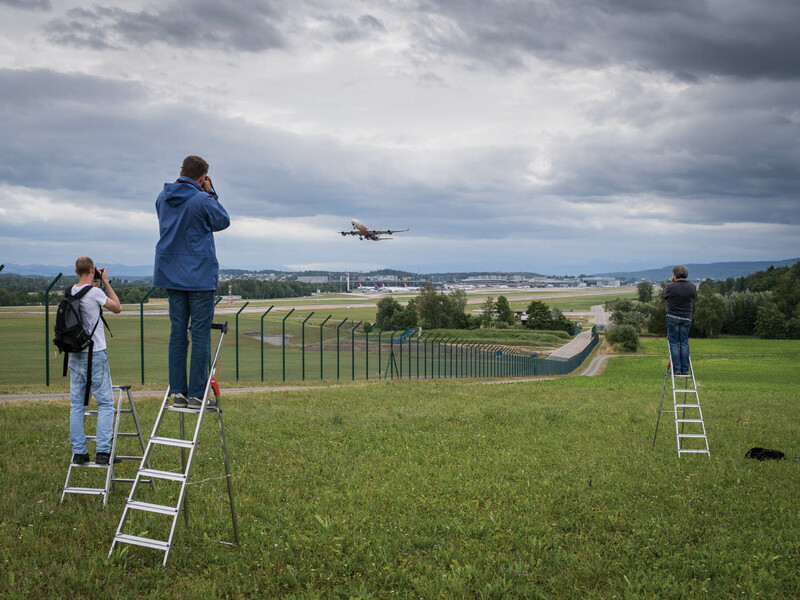 Plane spotters—or “avgeeks,” as some call themselves—travel around the world in order to hang out near airport runways so that they can watch and document planes as they take off and land. Before the advent of the internet, spotters would meet up at conventions or connect in the back pages of enthusiast magazines in order to trade mounted film slides of their best shots. Now they post pictures on online forums such as Airliners.net, PlaneSpotters.net, and JetPhotos.net, as well as on Flickr and Facebook groups dedicated to the art and practice of aviation enthusiasm. The details they collect provide an open-source trove of data about global commerce and politics, which has been invaluable to journalists and whistleblowers (not to mention various intelligence-gathering agencies) seeking to identify planes and their passengers. When Cleveland Cavaliers owner Dan Gilbert’s private plane flew to Florida in the summer of 2014, his visit was documented by spotters at Miami International, which allowed reporters to predict the return of LeBron James to his hometown. In December 2014, spotting data helped analysts track unlisted flights between Tel Aviv and the United Arab Emirates, despite the fact that Israel had a limited diplomatic relationship with the monarchies of Persian Gulf states. In the fall of 2015, Israel announced it would be opening it’s first diplomatic mission in the UAE. In 2007, Tunisian blogger Astrubal searched plane-spotting sites for Tunisia’s presidential plane. His crowdsourced effort revealed that although the president had made only three state-sanctioned trips, the plane had left the country more than ten times, with visits to European capitals where there was no record of official business. Astrubal’s conclusion that the president or his family was abusing Tunisia’s plane for pleasure exacerbated the tensions that led to the overthrow of the authoritarian government, the first wave of events of what would become the Arab Spring. In 2004, British Journalist Stephen Grey used plane-spotting databases to track CIA-leased Gulfstream jets used to transport prisoners to US “black sites,” where “enhanced interrogation techniques,” the official Bush-era euphemism for torture, could be carried out with impunity. Spotters observe clandestine military operations and monitor runways for errant wildlife or pilot error. They have caught corporations and governments in lies of omission; they have predicted business deals and their market impact. Their photos of planes track private money and public spending via the movements of CEOs and senators. 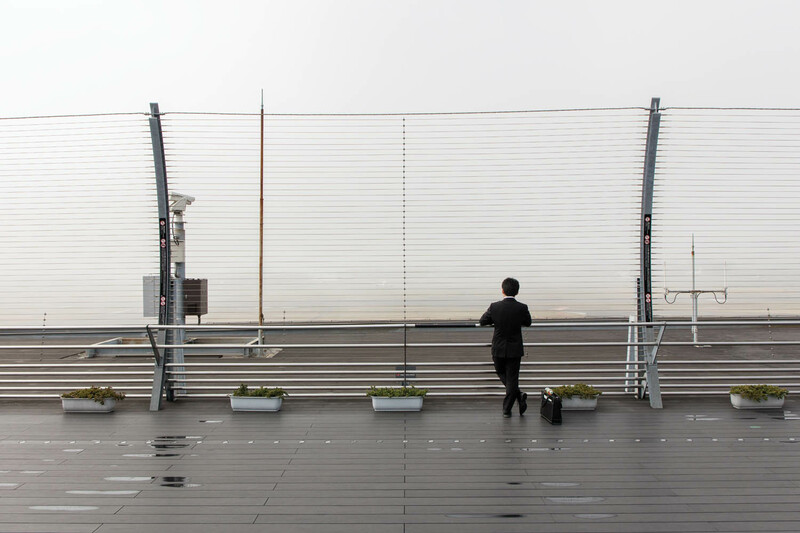 They observe events that are taking place in the open but would not be otherwise documented. They log arrivals at the G20, trips to The Hague, and visitors to the UN. The information they collect has helped journalists expose weapons exchanges, revealed the CIA’s secret practices, and provided intelligence about the arming of unstable governments. And yet none of the spotters I met thought much about their power through grassroots data collection. In general, spotters prefer to leave the puzzles for someone else to solve. They focus instead on the micro, the concrete. They care about nodes rather than vectors, gather units of information without scrutinizing their implications. Their interests are so basic that they seem abstract: to appreciate planes; to record them; to appreciate them by recording them; and to record their own passion for recording. They chase rare designs or unique color schemes or specific makes. They are invested in the community they’ve found while hanging out near the runway or while posting their pictures and spotting tips online. Some are content to log the tail numbers of planes that they see, while others tote around expensive cameras with obscenely telescopic lenses. They wait for hours to get the perfect photograph of special planes in ideal conditions: the sun’s rays highlighting an aircraft’s aluminum frame; the plane’s distinguishing components and paint schemes legible against the blue of a cloudless sky; the architectural elements on the ground and the action in the air creating an accidental harmony. They aren’t trying to make history, they just collect it. They are curators and taxonomists; archivists of their own wonder. Sepulveda Boulevard is the longest street in Los Angeles. It starts at the northern edge of the San Fernando Valley and stretches all the way to the ocean at Long Beach. Lincoln Boulevard is only 8.8 miles long, beginning at Santa Monica’s San Vicente Boulevard and running parallel to the coastline through Venice and Marina Del Rey. It ends where it meets Sepulveda, at the northeast corner of Los Angeles International Airport. There, the two boulevards form a single channel that hugs the runway and funnels traffic toward the airport entrance and the tangle of on-ramps leading to parking garages and fly-away lots. Where those two rushing roads cleave together is an ever-crowded In-N-Out Burger, which sits across from a little bit of green that is less a park than a median strip festooned with orange-flowered coral trees. On the afternoon I visited, the lawn was populated by listless teens in day-camp uniforms, office workers eating burgers in the shade, homeless men napping under tattered blankets, and a smattering of plane spotters—just a few guys in cargo shorts, plus a middle-aged couple who brought nylon beach chairs with cup holders in the armrests. Phil Derner Jr., a commercial-airline dispatcher, gazed east over Sepulveda, where a slight hill, or the illusion of one, made it appear as if arriving planes were rising up from behind the blue Goodyear store and the boulevard billboards. Growing up in College Point, Queens, just across the waters of Flushing Bay from LaGuardia Airport and Rikers Island, Derner would sit at the sooty window of his third-story bedroom and watch planes streak through the night sky. “They were like fireworks to me,” he said, “but better.” In his early twenties, while working as a bouncer at various downtown Manhattan clubs, Derner made a friend who shared photographs he’d taken while plane spotting at LaGuardia, rekindling Derner’s childhood fascination with planes. Soon after, he launched a newsletter for eight friends that eventually blossomed into the online plane-spotting community NYCAviation.com. Back on the lawn, in between landings, Derner lolled on the grass with a vintage aeronautics magazine open to a column about space titled “Man Didn’t Look Forward By Looking Back” while he and Morgheim reminisced about planes they’d seen recently. Derner periodically checked the FlightAware app on his phone, which gave the location of incoming flights as they hurtled toward LAX. “It looks like we got the A380 approaching,” he said, pulling his camera out of his bag and excusing himself as he darted up the stairs of the parking lot above the In-N-Out. Morgheim and I stood together in silence until he pointed eastward: “Here she comes.” A colossal sky-blue Korean Air A380 appeared all at once, soaring impossibly close to the gangly boulevard palms and their trembling fronds. Conceived in the heady economy of the 1990s but arriving during the insecure aughts, the Airbus A380 is an awkward symbol of conspicuous consumption in an age of extreme wealth disparity. Design and production took almost twenty years and a reported $25 billion to complete; when it debuted in 2007, Airbus gambled that the largest passenger jet in operation would relieve airport congestion and reintroduce glamour to international travel. But by the summer of 2016, the company announced it was cutting back production of the A380; amenities like onboard showers and full cocktail lounges for luxury-class tickets had failed to entice airlines to invest. Still, there is nothing like it flying today. 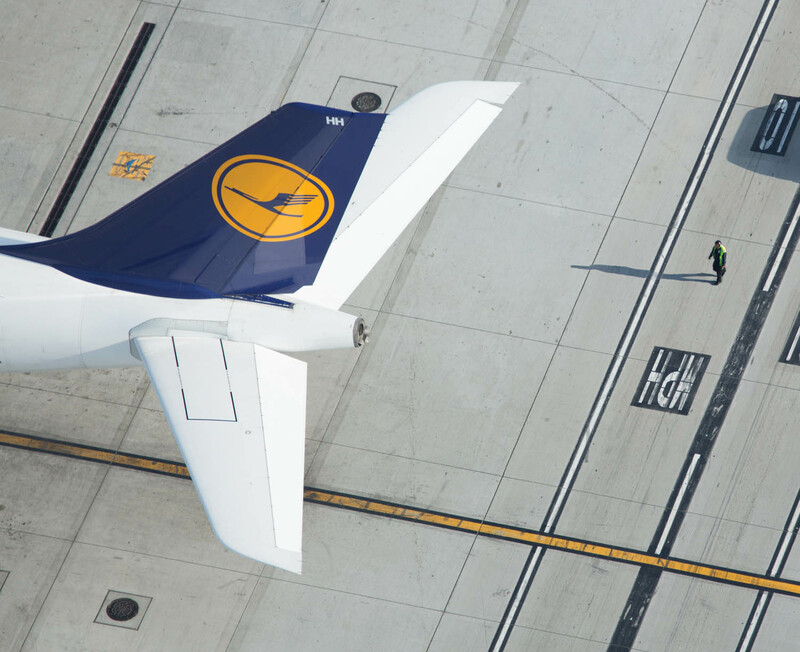 The body of the plane is 239 feet long; its wingspan is 261 feet wide. 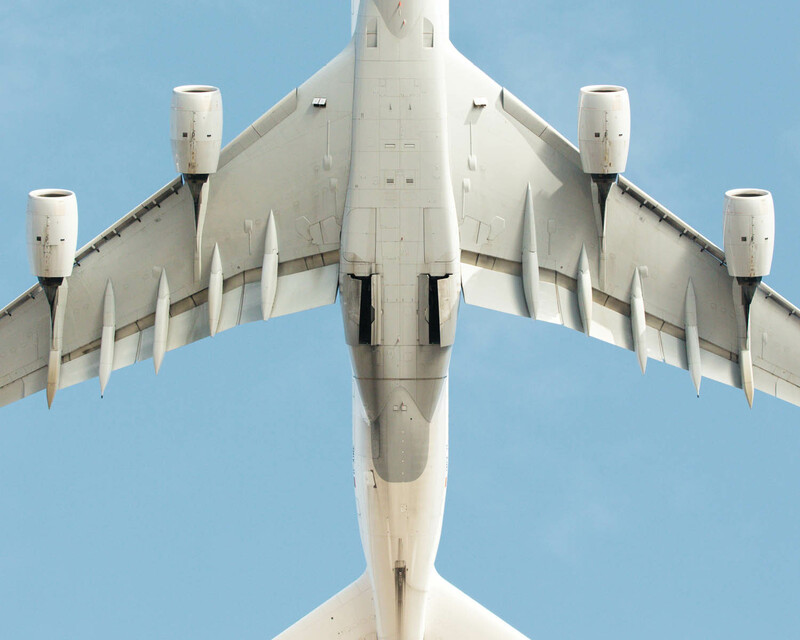 It towers seven stories high and weighs up to 1,268,000 pounds on takeoff. It can travel at almost 600 miles per hour at altitude, approaching the speed of sound. Derner returned from his perch above In-N-Out. “I got it,” he said, showing me his camera’s LCD screen. In his shots we were tiny dabs of color on the green. The glossy red umbrellas of the fast-food restaurant were clustered at the bottom of the frame, while the park’s frizzy palms seemed to caress the underside of the fuselage. The plane, so much bluer than the blasted blue of the summer sky, looked weightless. Since the turn of the last century, when celebratory airshows valorized the breaking of distance, altitude, and speed records, spotters have been enthusiastically logging the various taxonomies of planes. During World War II, when the threat of aerial attack became a pressing national concern, the US military launched an organized effort to encourage citizens to educate themselves about the makes and models of aircraft. Hundreds of thousands of volunteers on the American seaboards joined the Ground Observer Corps, a civil-defense organization dedicated to surveilling the sky. A front-page article in the Oakland Tribune from September 1, 1942, trumpeted the diversity of citizens who had committed to observation shifts, including women, children, and the actor Henry Fonda, who set up a camouflaged post on his own West Los Angeles estate. From 1942–43, NBC broadcast more than sixty episodes of Eyes Aloft, a radio dramatization of true stories collected from Observer Corps volunteers. Information gathered by citizen observers was passed on to filter centers by telephone, then sent to plotters in the Aircraft Warning Service, who identified the nature of the flight. But because observers had no formal training, the system was far from perfect. The primary result of the program was a sense of patriotic self-sacrifice and an enduring protectionist paranoia. It is impossible to say how many plane spotters practice across America, but the photographs filling online databases suggest that wherever there is a plane taking off or landing, there is likely someone watching it, likely with a camera. Since 9/11, police have become more vigilant about discouraging people from loitering near runways or hangars. Some cities have passed laws that prohibit approaching runway perimeters; other cities direct police to stop anyone near an airport who seems suspicious. In 2001, a group of British spotters were arrested and convicted in Greece on espionage charges (they were later acquitted). That ordeal and other minor encounters with law enforcement have made aviation enthusiasts wary of airport officials. But in the spring of 2014, Miami International Airport (MIA) announced an unusual alliance between spotters and law enforcement, a program called Miami Airport Watch, which trained members of the spotting group Florida Aviation Photographers on how to report threats on the runway. MIA’s then Assistant Director of Security and Public Safety, Lauren Stover, spearheaded the effort, adapting the Ground Observer Corps model to the “See Something, Say Something” logic of the Homeland Security era. After training 70,000 workers, from terminal janitors to gate agents to food-service employees, in behavior detection, she turned to members of Florida Aviation Photographers to help detect anomalies in normal airport procedure, instructing them to report suspicious behavior to the police. Suresh Atapattu, a Miami-based spotter whose impressive aviation photography led to a long-term project shooting NASA’s last space shuttle, said that in the first few months of the collaboration, no one in the group had seen much worth sharing. (He explained that one of the biggest risks at MIA is that rabbits are often run over by airplanes. Their carcasses attract vultures, which can get sucked into an aircraft’s engines.) The most notable occurrence thus far was when the group spied a guy pulling up just beyond the parking lot abutting one of MIA’s runways. “He began to dress himself in SWAT gear—body armor and weapons,” Atapattu recalled, “as if he were mounting up.” The cops were called in, but when they arrived the man was bewildered by the commotion; it turned out that he was simply getting dressed for a comics convention at a nearby hotel, where parking was expensive. He looked like he was arming himself for war, but he was a hobbyist just like everybody else. On a broiling summer Saturday, when the concrete of Runway 9 was blurry with heat, spotters set up beach chairs in a shady corner of a furniture-store parking lot at the southwest corner of MIA. A couple of men perched on concrete blocks with long-lens cameras slung like rifles across their bodies. The only other woman besides me was a sullen tween with a long braid who kicked pebbles along the weedy rail ties set parallel to the runway. A group of young men in reflective sunglasses introduced themselves to the regulars as visitors from Costa Rica, proceeding to regale the enthusiastic group with tales of President Barack Obama’s historic visit to San Jose, an event described by one government official as “one of the biggest security operations in the history of Costa Rica.” The crowd listened rapturously as the guys listed all the planes, trucks, tanks, and armored cars they spotted from a restaurant near the airport. Rivas and his buddy Robert Collazo spend their days off spotting at Miami’s numerous airports. MIA was slow that day, so the pair decided to check out what was happening on “the weird side of Miami aviation,” ten miles north in Opa-locka. There, from a sandy swath of runway cut out of the meadowed flatlands, America’s most famous disappeared aviator, Amelia Earhart, began her last attempt to fly around the world in 1937. The airport was known as Miami Municipal Airport then, and the city of Opa-locka was in its infancy, a rich man’s lark built in the style of a Moorish revival fantasy out of One Thousand and One Nights (complete with a turreted city hall). Despite such grandiose origins, the city developed a rather sinister reputation, in part because of what transpired at its airport. In the 1930s, Miami Municipal served as a base for secret military operations in Central and South America, home to Eisenhower-era “black flights.” In the 1960s, it was where the CIA coordinated with Cuban refugees in preparation for the Bay of Pigs invasion. After the military contracts ended, arms dealers and drug cartels took advantage of lax oversight, moving untold amounts of product through Miami Municipal’s runways and surrounding fields. By 2004, Opa-locka had the highest crime rate in the United States. The city’s infamy has only been magnified by the fact that in 2000, future 9/11 hijackers Mohamed Atta and Marwan al-Shehhi learned how to fly 727s on computers at SimCenter, a flight school at the airport. In 2014, Miami-Opa Locka Executive Airport, as it is now called, attempted to rebrand, building a gleaming new terminal to appeal to wealthy passengers on charter jets. Despite the upgrade, by the time I visited, half of the airport’s tarmac was populated by orphaned planes: aircraft seized by law enforcement or otherwise grounded. Collazo pointed out some World War II-era fighter jets, a couple of chubby DC-3s, and an eagle-decorated Capital Airways 737 that he suggested was a CIA cover. The airport may be attracting a tonier clientele, but it remains the site of monied secrets. According to aviation-security consultant Richard Thorn, the most clandestine activity at Opa Locka is no longer carried out by drug lords, but by the US government, which uses the airport to quietly transport people and goods to Guantanamo and points beyond. We tend to take for granted that it is possible to know everything about every plane in operation at any particular time, perhaps because it’s a reassuring assumption when so much of human livelihood relies on air travel and transport. When Malaysia Airlines Flight 370, a 777 carrying 239 people, disappeared somewhere above the Indian Ocean in the spring of 2014, many people expressed disbelief that an aircraft weighing almost 500,000 pounds could simply vanish. That reaction revealed a common assumption—that air traffic control monitors a plane’s location at all times. In reality, contact is sketchier: Flights across oceans are sporadically in touch with radars on land. 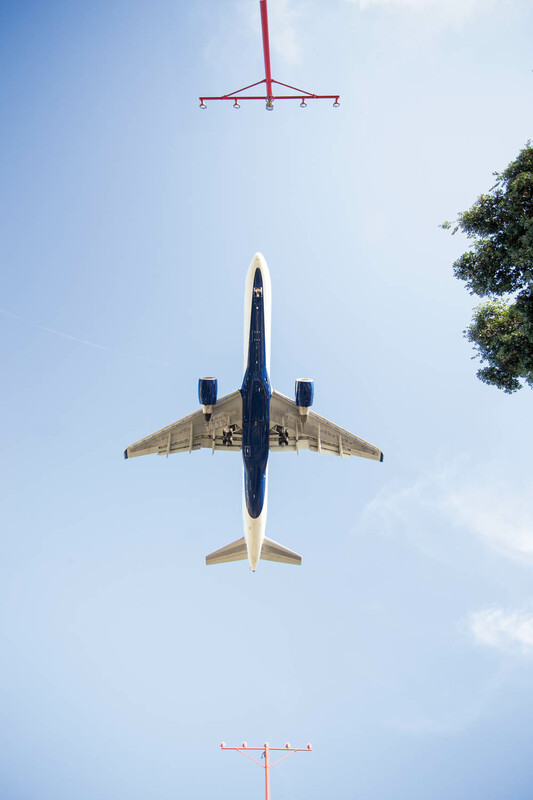 The International Civil Aviation Organization, an agency of the United Nations, has mandated that by 2018, all commercial planes must report their positions every fifteen minutes. In the meantime, avionics companies like Rockwell Collins are working on technologies that use data from satellites in order to gather the real-time locations of planes, under the assumption that consumer demand (born of fear) will precede international regulation. But there are vast blind spots in airplane movement that have nothing to do with lapses in technology. In 2000, the lobby group National Business Aviation Association (NBAA) and the FAA began the BARR (Block Aircraft Registration Request) program, which allowed American private planes to delist their tail numbers from public tracking apps for security or privacy reasons—without documenting actual threats. Pitched as a way to protect planes from terrorism or corporate espionage, the law provided a way to sidestep the kind of scandal that beset the CEOs of General Motors in 2008, when they flew luxurious corporate jets to DC to ask the government for a bailout. That kerfuffle drew attention to the journalistic utility of plane tracking, and resulted in a lawsuit against the FAA brought by the nonprofit investigative organization ProPublica, which demanded that blocked registrations be released under the Freedom of Information Act. ProPublica’s subsequent review showed that the blocked planes were registered to several Fortune 500 companies, government agencies, evangelical churches, college booster clubs, even the owners of newspapers that have often championed transparency. Although these organizations may have had legitimate reasons for hiding the movements of their planes from the public, such as the risk of espionage or damaging exposure, their invisibility eliminated the possibility of oversight on corporate malfeasance or government corruption. The conflict between privacy and transparency is complicated by the fact that plane owners can set up third-party trusteeships through financial institutions—such as the Bank of Utah, under which the plane spotted in Iran was registered—in order to obscure their controlling interest. If a plane is registered to a bank trust, no amount of tracking can reveal who is actually operating the plane, or whether it’s being operated for personal, corporate, or governmental use. There were almost 13,000 private jets registered in the US in 2014, and the Bank of Utah is just one of the many organizations that offers these kinds of trusteeships, which suggests that a lot of important air travel takes place in the shadows, beyond the reach of tracking sites or paper trails. The only way we know about these flights is when someone—most likely a spotter—happens to record them. Even then, it’s possible that some planes will never be traced. On a cold December morning in 1903, Orville and Wilbur Wright launched the first powered flight from a beach in North Carolina, while a local man, Kitty Hawk Life-Saving crewman John T. Daniels, recorded the event with the brothers’ bulky Gundlach Korona 5×7-inch glass plate view camera. The Wrights had recruited Daniels, who had never operated a camera before, to provide evidence of their experiment. As the Flyer left the Earth behind, Daniels, mesmerized, almost forgot to squeeze the shutter trigger he had just learned to use. On a brisk autumn morning, spotters garlanded with hefty DSLRs gathered on the muddy banks of Jamaica Bay, Queens, across the water from JFK Airport. One of the busiest international gateways in the country, the airport was built in 1942, in an effort to relieve congestion at New York City’s LaGuardia Airport. The Port Authority leased the site of the former Idlewild Golf Course, using millions of cubic yards of hydraulic fill to transform the salty marsh into solid ground, then paved over the new land with miles of asphalt for the runways of New York International Airport, rechristened after John Fitzgerald Kennedy following his assassination in 1963. The crowd had been gathering there all week while world leaders and diplomats—many traveling on private planes, including rare vintage models—arrived to attend the United Nations General Assembly meeting, held each September in New York City. Phil Derner described UN Week as “our Super Bowl.” The most anticipated sighting of the day was, of course, the arrival of Air Force One. This kind of techno-optimism is common for spotters, who get excited about particular airplanes and certain airlines without taking a moral view of politics into account: Planes from Iraq, or Iran, or Syria were “hot,” Gonzalez told me, because they came from places at the center of the news, and because, during UN Week, it was a good bet that when they landed there were heads of state on board. Seeing an Iraqi Airways jet, Gonzalez explained, was like “seeing the Mona Lisa for the first time. Da Vinci touched that canvas with his paintbrush. It isn’t remote.” It was telling that he used the Mona Lisa as an example of immediacy. The painting is notorious for being impossible to experience firsthand—not just because of the 1.5 inches of glass and resin protecting it, or the throngs that travel from all over the world to take its picture. We’ve seen it so often, in so many different appropriations and reproductions, that it’s impossible to see it as a painting composed of da Vinci’s brush strokes and not a symbol or cliché. But spotters like Gonzalez have retained a sense of awe for flying machines that does not lessen through exposure, or the awful damage done by war machines, or the banalities and indignities of travel in the twenty-first century. They’ve preserved the fresh awe expressed by Byron Newton of the Paris Herald, who wrote of watching one of the Wright Brothers’ exhibition flights: “This spectacle of men flying was so startling, so bewildering to the senses … that we all stood like so many marble men.” The pictures that spotters take of planes do not diminish that wonder, either; in fact, the pleasure that spotters get from “taking the greatest picture of the rarest airplane and recording it forever,” as Gonzalez put it, only seems to intensify with reproduction. In the distance, I could just make out the thin profile of the airport: Runway 4L/22R, some hangars, and the mushroom-like control tower sprouting above the terminals. A few men with fishing poles were perched on a cement block half-submerged in the briny bay. Some spotters approached to congratulate Gonzalez on his Airliners.net post: He had used a special photo for the occasion—a rare shot of John Travolta’s private Boeing 707 painted in period colors for the now-canceled show Pan Am. He’d taken the picture years ago but saved it for this landmark moment. There was a low thrum of excitement in the group, but also a bit of weariness. One man, who claimed to have been spotting at JFK since his youth in Queens in the 1970s, now lives in New Jersey; he’d been waking up at 4 a.m. every day to drive in with another plane-spotting friend who’d flown in from Houston so they could spend UN Week together. A Hasidic man emerged from the tall grasses. At first he appeared to be lost, or just investigating the scene. Then he got out a gigantic DSLR and started shooting the landing planes, too. A murmur: The air traffic at JFK had quieted, hinting that Air Force One was on its way. Then the scramble: “It’s time,” Gonzalez said, pointing to our right as the plane, its blue muzzle the same shade as the ruffled bay, appeared above a line of scrubby trees. Some spotters ran closer to the water, their shutters clicking as they moved. Even the fishermen grabbed their phones to take a few pictures, although as soon as I saw the plane, I wondered if they were compelled more by the spotters’ excitement than by the spectacle itself. It wasn’t the force or the size of the plane that was remarkable—it was far enough away that the scale was hard to comprehend, and the roar of its engines was imperceptible. The power was in its primacy: in the meaning behind the words painted in the familiar serifed script of the Declaration of Independence; in the potentiality of the plane’s presence here in New York; in its ability to still all traffic at JFK, to gather us on that beach, to tilt our faces toward the sky. Around me, the cameras swung from right to left in unison as the plane landed and taxied to a hangar. Rose Lichter-Marck is a journalist, screenwriter, and photographer whose work has appeared in the New Yorker, Guernica, Lenny Letter, and VICE, among other publications. She is a contributor at Rookie; her writing and photography were included in Rookie Yearbook Three & Four. She wrote the screenplay for the film Stand Clear of the Closing Doors, which played at over sixty film festivals and won prizes at Tribeca, Deauville, and Athens, before being distributed by Oscilloscope Labs in 2014. Mike Kelley is a Los Angeles–based photographer who photographs architecture, aviation, and infrastructure. He studied studio art and environmental science at the University of Vermont. His clients include Emirates and Vail Resorts. His work has been featured in Los Angeles Magazine, Real Simple, Gizmodo, and elsewhere. Miami Municipal Airport was not the same airport as Miami Opa-locka Executive Airport as stated in the article. Miami Municipal Airport, renamed to Amelia Earhart Field in 1947, was a separate airport owned by the City of Miami two miles south of Naval Air Station Miami which turned into Opa-locka Airport in the early 1960's. Amelia Earhart took off from Miami Municipal in 1937 on her ill-fated flight around the world and is now the site of the Hialeah Police Department headquarters and a huge UPS sorting facility.